An Introductory Workshop for those who want to learn about the Art of Oral Storytelling, hosted by the Burlington Storytellers Guild. Doors open at 7pm, starts at 7:30. 75 Melville Street Elora, ON. Bernadette Rule (Ryan) of Dundas back again, thank goodness! Jean Ryan (no relation) of Hamilton, at Fresh for the first time, finally! both of whom are stellar tellers who will delight you!As usual, $5 cover – come easy to ensure a seat in our small venue. Please bring your listening ears, and a story to share if you wish. We thank the Region of Waterloo Arts Fund for their generous support.Please share this message and flyer with anyone you think might enjoy this, too.This coming Friday I will not be available; Brenda Byers, storyteller from Burlington, will host the evening. Join us for our 10th season of stories by the river. We have a special lineup of guests this year. Bring a chair if you can. All ages. Younger listeners can sit by the edge if they need to wiggle. 6:30 – 8:30 pm – note earlier start and finish. Bring your ears, your friends, your stories. Watch the National Storytelling Festival Livestream! Can’t make it to this year’s National Storytelling Festival? We’ve got you covered. On Friday, October 2nd, we’re streaming video live from our Family Tent so you can join us in Jonesborough from wherever you happen to be. The live broadcast of family-friendly storytelling will run all day, 10:00 a.m. to 10:00 p.m. Whether you want to throw a viewing party, check in on your phone during lunch, or binge watch the whole thing from the comfort of your couch, our master storytellers are here for you (and your friends and your family and your colleagues and your students and…well, you get the idea). It’s easy, it’s entertaining, and it’s free! Just visit https://livestream.com/accounts/323851/storyfest any time during the livestream on Friday, October 2nd. You can also use the hashtag #storyfest on Twitter, Facebook, and Instagram to connect with our audience in Jonesborough and other people tuning in from around the globe. For more information, including a complete schedule of performers, please click here. The National Storytelling Festival livestream has been made possible thanks to the generosity of the Niswonger Foundation. The Family Tent is sponsored by Dollywood’s DreamMore Resort. This is a reminder that the sequel to In the Wings, which is entitled Brought to Light: More Stories of Forgotten Women, is being launched Wed. Oct. 21st at 7 pm at the Carnegie Gallery in Dundas (please see the attached poster). This book is also edited by Bernadette Rule. It would be wonderful to see you there. Many of the writers will be there to present their forgotten women. I have a story of Catharine Coffin (of the Underground Rail Road) in this book, and will be one of the readers. I hope you can join us for what I know will be a fascinating evening. Please share this with anyone you think might be interested. All are welcome. Thurs., Oct. 29, 2015, 7 p.m.
Folklore lovers! Meet social historian Joanna Rickert-Hall and learn about a well-known 19th century Waterloo County Mennonite who had the ability to perform healing acts that were beyond the normal scope of medical science. Castle Kilbride in Baden, October 29 at 7:00 p.m. Pre-registration required. $15. What this workshop is about? Choosing the “right” story ~ or, stories that choose you! Participants will need to bring their inner child, passion, curiosity, questions and invaluable experience. 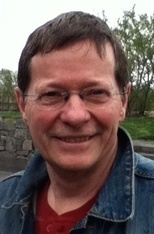 Bob Tadman has been a storyteller for over forty years. He has provided workshops and courses for tellers at all ages and experience, including York University’s The Art of Storytelling. Bob has a wide repertoire of Folk Stories, Legends, Biblical Stories and Tall Tales, but he especially loves sharing Experience Stories for the way they ignite storytelling in others. A retired teacher and principal, Bob is passionate about creating connections and community through storytelling. At: The Button Factory, 25 Regina St. South, Waterloo, Ontario. Payment: $40 by cheque before Nov 3rd made out to Baden Storytellers Guild, $45 at the door. Space is limited so act soon if you want to participate in this workshop. CHANGE OF VENUE! Thank goodness Monica Braun of MonigraM Coffee Roasters has stepped up to the plate and offered a new venue for FRESH STORIES. This month; this Friday, in fact, June 19, 2015, Fresh Stories will not be celebrating stories at MonigraM Coffee Roasters, as we have chosen instead to join in celebrating many other arts here in Cambridge during the Mayor’s Celebration of the Arts. (Now isn’t that a cool thing? Our Mayor Doug Craig does this every year, to bring the arts to the fore here in little hockey town Cambridge – a day set aside to celebrate arts in general and specifically, including culinary arts.) Storytelling will resume in July. 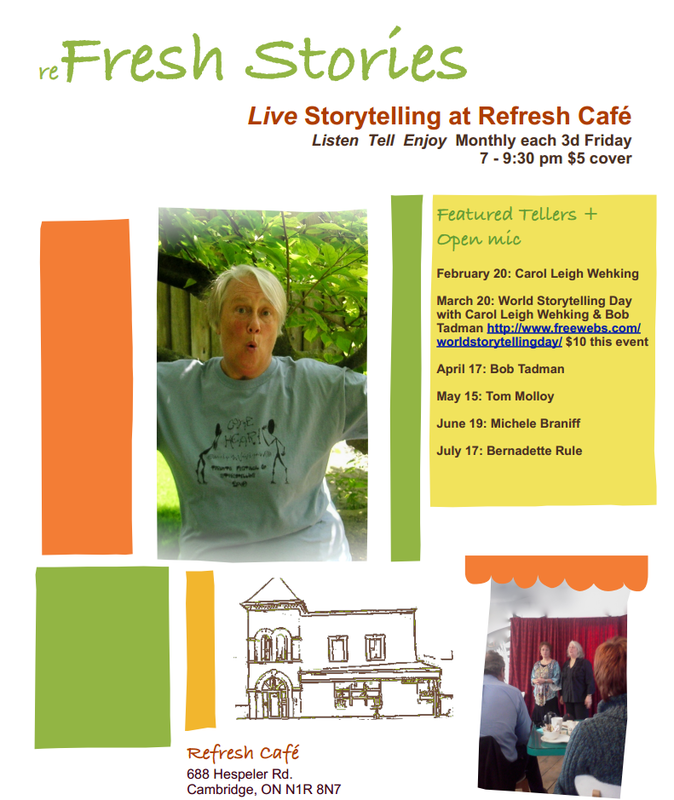 On July 17, 2015, Fresh Stories will again take place at MonigraM Coffee Roasters, 16 Ainslie St S, Cambridge, at a new, earlier time: 6:30 to 8:00. July features the multi-talented Bernadette Rule from Dundas, Ontario – I’m hoping she will tell the story of French Toast, among others! Then on August 21, 2015, Cambridge’s own Michelle Braniff, recent Artist-in-Residence, and master of several art forms, who had been scheduled for June, will regale us with stories; I’m hoping the story of Daddy’s coat tails in Canadian Tire will be included. Latitudes Storytelling Festival’s turning 10 this year! Come find us at Summer Lights Festival in Kitchener on June 20, as Brad Woods and Tina Grinberg (TBC) tell stories in intimate settings in downtown Kitchener. Make sure you’re around for the 2015 festival, which will be held in partnership with Neruda Arts’ Kultrún World Music Festival on July 11-12 in Victoria Park, Kitchener. We’re proud to celebrate this milestone with Neruda at Kultrún! Confirmed performers include Candy Royalle (Australia), D’bi Young (Toronto), Jay Wilson of Pandora’s Sox, Stand Up for Mental Health comedy troupe, and the KW Poetry Slam. The festival is free, as always, and the hours are noon-6 p.m.
We are looking for storytellers, particularly for the children’s venue. If interested, please contact Meg Leslie at info@latitudesfestival.com. The Guelph Guild of Storytellers is once again partnering with the Enabling Gardento present a summer of storytelling. The one-hour programme, commencing July 3 and continuing until August 28 will consist of nine Friday morning performances by local and invited tellers, as well as several local musicians. The sessions, held at the Garden in riverside Park, run from 10:30 am until 11:30 am. Second Wednesday of each month. The Guelph Guild of Storytellers tells on the second Wednesday each month from 7:00 pm to 8:30 at the intimate, book-lined Community Den on the ground floor of The Bookshelf. Plenty of on-street and lot parking, and a year-round schedule. Audience and tellers welcome. Please contact us first if your story is over 10 minutes. —————For more events in Ontario, see the calendar at Storytellers of Canada – Conteurs For more events in Ontario, see the calendar at Storytellers of Canada – Conteurs du Canada.du Canada. Featuring Brad Smith (Author of the ‘Virgil Cain’ Trilogy) and Sonia Day (Author of ‘Deer Eyes’). Please call 519-846-9698 to be on the readers’ list. August 23, Storytelling at 1:30 pm. Pictures from our concert in March. Many thanks to Celia Lottridge, this year’s StorySave honored teller.